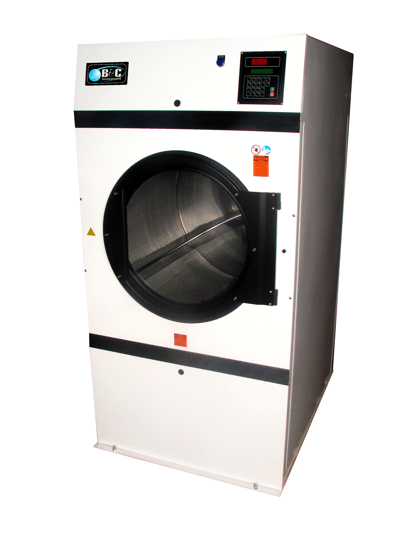 To complement our line of superior washer-extractors, B&C Technologies offers the most rugged dryers in the industry. A low initial investment is only the beginning of your savings. 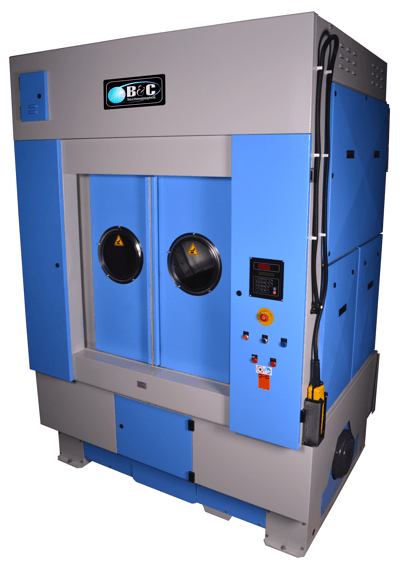 All B&C dryers are manufactured with fewer parts which means fewer break downs, less downtime and less maintenance. Easy installation saves you money and time, allowing you to have your have your laundry up and running in a matter of hours. 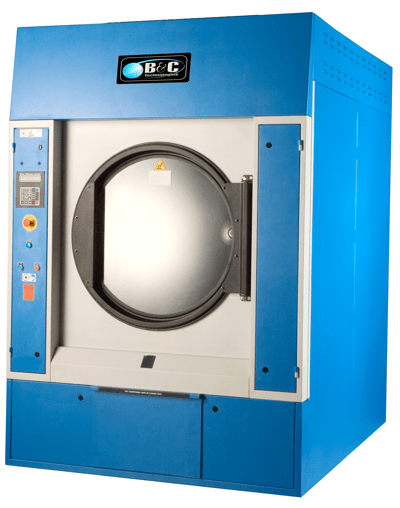 Engineered and manufactured with installation in mind, these sturdy dryers use welded steel cabinets and heavy duty steel bases that can be easily moved without damaging the machine. 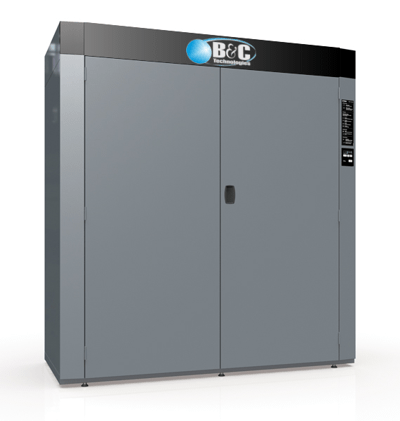 The B&C line features an energy saving, fully enclosed, insulated cabinet. This leads to much quieter operation as well as keeping the heat in the dryer where it belongs. High airflow rates and high BTU burners dry the goods quickly for increased productivity in the laundry. Our durable drive system is built to last. Fully enclosed fan cooled motors, cast iron pulleys, plus a standard stainless steel drying cylinder make the B&C line of dryers the best value in the industry. Never waste time and money over drying your goods again. Humidity sensing is available on all machines that are equipped with the microprocessor control. Even the doors are designed for ease of use and long life. Swinging doors open 180 degrees for increased accessibility. Maintenance on the B&C dryer door is reduced by our service free magnetic latch and our gasket free design. You’ll find exactly what fits your drying needs. Europeans have been using drying cabinets for over fifty years both professionally and domestically as a complement to standard tumbling clothes dryers. Now available in the Americas, drying cabinets are proving to be indespensable for goods that can not be traditionally dried. The drying cabinet dries efficiently without mechanical action at exactly the right temperature and humidity. Studies show that 20-30% of garments worn daily should not be tumble dried as many show a do not tumble symbol on the care label. A drying cabinet is ideal for articles not suitable for tumble dryers as well as special processes like wetcleaning. Gentle drying action leads directly to longer fabric life, as the goods are not tumbling against each other or against the drying cylinder. Drying cabinets have a much longer life span than conventional tumble dryers due to very few moving parts. B&C drying cabinets feature sturdy construction and excellent engineering which leads to extended machine life. New controls and fan systems have made the cabinets highly energy efficient, creating lower energy costs. Flat packaging saves shipping costs and reduces shipping damage. Manual or automatic drying modes with accurate temperature sensing and our unique humidity tracking system (HTS) prevents over drying and saves energy. Underpressure drying technology creates a partial vacuum by utilizing three fans which speeds drying time and lowers energy costs. B&C Technologies has a exceptional line of professional drying cabinets designed for many different markets and custom marketplaces. The combination of decades of experience and our new technology makes our drying cabinets an excellent alternative and complement to tumble dryers. Drying Cabinets for Efficient Hang Drying of Delicate Garments that should not be Tumble Dried. Perfect for Drycleaners, Wetcleaners, Theaters, Ski Resorts, Daycare Centers and more. 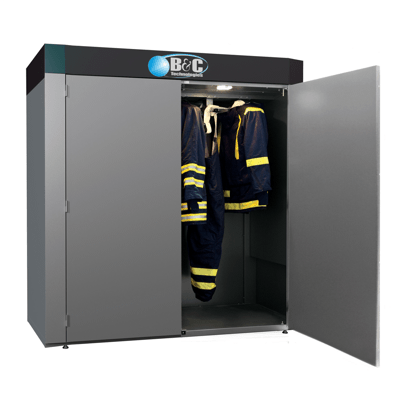 Large Sized Drying Cabinet for Efficient Hang Drying of Firehouse Turnout Gear and Protective Overalls, Gloves, Boots, Masks, and other Station Wear as well as Wet Suits and Dry Suits.